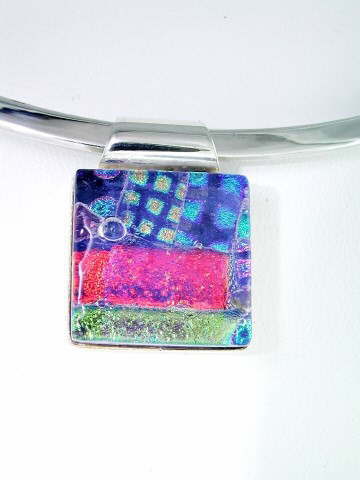 Striking square Dichroic glass pendant with flashes of pink, blue, turquoise and pale green. Dichroic glass is made by heating layers of titanium leaf at varying temperatures. The result is quite spectacular and pendants posess a 'peacock feather' type brilliance. The photograph really does not do the pendant justice. Set in 925 sterling silver.